When I really get into a book, so much so that I cry and laugh out loud, I start hoping for more pages. It doesn’t matter how well the story fits its length, I will want more. That is the way it was as I read Righteous Anger. I am not good with names, so getting to know the characters in a novel can often be a struggle for me, especially if there are a lot of people to keep track of. The first chapter of Righteous Anger had me worried, but the story pulled me right in. Lynda Williams creates amazing and wonderful worlds for her characters to live in. There is history and detail, but it doesn’t overwhelm the story, it compliments it. Every one of Lynda’s characters seems to be an individual with their own reasons for doing what they do, which might be why it isn’t a struggle to figure out who’s who. There don’t seem to be straw men or stereotypes. As I read Righteous Anger I felt like I was there with the main character, and that if I turned my head the world would be just as full and interesting down a different road or following another character. 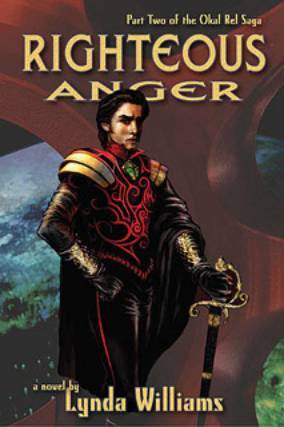 Righteous Anger follows Horth, the third son of Hangst Nersal and Beryl Nesak. Through his growing pains and aspirations Horth attempts to be a good son, learning how to handle a sword, pilot a ship and navigate in space. He learns honour from those he believes to be honourable. Eventually he must follow his own beliefs when those around him fail to live up to theirs. In the Okal Rel universe justice and honour are maintained by the sword. Just like the knights of old, the one that wins is considered to be right. But unlike the knights of old, these duellers are descendants of genetically improved humans. They are strong and agile, quick to heal, and emotionally vibrant. Fighting is meant to be one on one, rather than all out battles or wars. They have lost too many lives and even whole genetic lines in the past deputes, so the Okal Rel law of the sword is meant to limit such deaths. The law doesn’t stop the intrigue, subterfuge, politicking, and hidden violence, but the desire to seem honourable allows the families/houses to function with some order. Righteous Anger fits well with the other Okal Rel novels The Courtesan Prince, Part One and Throne Price, Part Four. I find myself hoping that part three of the Okal Rel series will be out in print soon, because I find myself desperately wanting more pages from Lynda Williams.